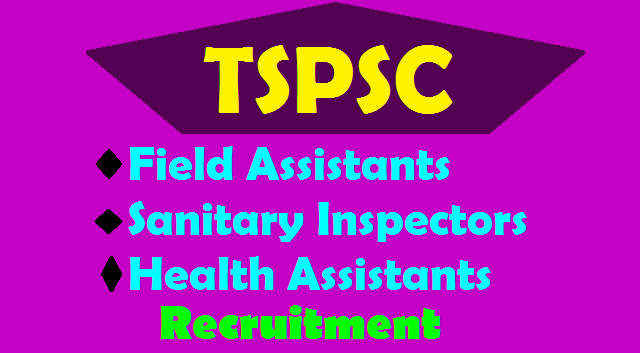 TSPSC has announced Sanitary Inspectors, Health Assistants, Field Assistants 2018 Recruitment notification on 27-07-2018 Applications are invited Online from qualified candidates through the proforma Application to be made available on Commission’s WEBSITE (www.tspsc.gov.in) to the post of Sanitary Inspector in MA and UD, Health Assistant in MA and UD and Field Assistant in TSDDCFL in the State of Telangana. Applications are invited Online from qualified candidates through the proforma Application to be made available on Commission’s WEBSITE (www.tspsc.gov.in) to the post of Field Assistant in Telangana State Dairy Development Co-Operative Federation Limited, Health Assistant in Municipal Administration and Urban Development Department in the State of Telanagana, Sanitary Inspector in Municipal Administration and Urban Development Department in the State of Telanagana. NOTIFICATION NO. 21/2018 , Dt. 27/07/2018 FIELD ASSISTANT IN TELANGANA STATE DAIRY DEVELOPMENT CO-OPERATIVE FEDERATION LIMITED. 1) Applications are invited Online from qualified candidates through the proforma Application to be made available on Commission’s WEBSITE (www.tspsc.gov.in) to the post of Field Assistant in Telangana State Dairy Development Co-Operative Federation Limited. 2) The Examination (Objective Type) dates will be announced later. Intermediate with Biological Science of State Board of Intermediate Examination. # FIELD ASSISTANT IN DAIRY DEVELOPMENT Notification. Applications are invited Online from qualified candidates through the proforma Application to be made available on Commission’s WEBSITE (www.tspsc.gov.in) to the post of Health Assistant in Municipal Administration and Urban Development Department in the State of Telanagana. (i) An Intermediate with Biological Science or 10+2 equivalent standard Biological Science as one of the subjects. (ii) A pass certificate in Multi Purpose Health Assistant Training Course / Sanitary Inspector Training Course certificate awarded by the Chairman, Board of Examinations constituted by the Government of Telangana or from Government of India / Government of Telangana Recognized Institution. Director of Municipal Administration must be submitted at the time of joining by selected candidates. # HEALTH ASSISTANT IN MUNICIPAL ADMINISTRATION Notification. 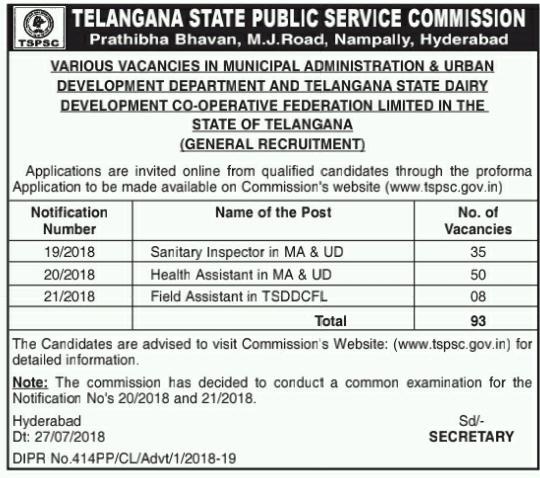 Applications are invited Online from qualified candidates through the proforma Application to be made available on Commission’s WEBSITE (www.tspsc.gov.in) to the post of Sanitary Inspector in Municipal Administration and Urban Development Department in the State of Telanagana. ii. Last date for submission of ONLINE applications Dt. 30/08/2018.The payment of Fee will not be accepted after 11:59 P.M of last date for submission. Educational Qualifications as specified by the G.O.Ms.No.84, MA&UD (G1) Dept., Dt:14/02/2012. # SANITARY INSPECTOR IN MUNICIPAL Notification..
# SANITARY INSPECTOR IN MUNICIPAL Notification.